Ground Rush Adventures/ Skydive Swakopmund offers tandem skydiving as well as courses in accelerated freefall and static line jumps. 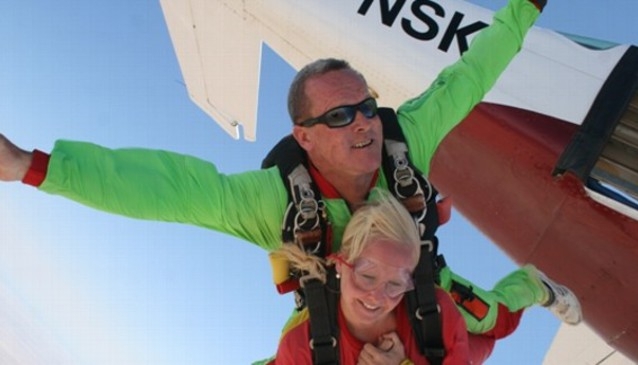 Experienced tandem masters are always on hand to attend to the adrenaline junkies and accelerated freefall and static line instructors are also available to coach and present skydiving courses. Ground rush is open seven days a week all year round so visitors always have the opportunity to experience this thrilling rush. After driving out to the Drop Zone which is in the amazing Namib Desert, visitors are trained and dressed in the appropriate gear, this is followed by a short walk to the aircraft. There is a 25 minute scenic flight up to 10 000 feet above Swakopmund and its surrounding areas, at this time visitors' equipment is crosschecked by the tandem master and after a 'ready set go' from the instructor, the fall begins. Falls can go up to speeds of 200km/h. After a 30 second adrenaline filled freefall, the parachute deploys and gently guides the visitor back down to the desert floor. The Accelerated Freefall Course or AFP is designed by professional skydivers. there are 8 performance levels that visitors take at their own pace, learning basic body flight and canopy skills. Upon successful completion of the course, visitors will have the tools to be safe skydivers. The Static Line Course is the most cost effective way of learning to skydive. It includes a 6 hour training course where students learn how all the equipment works and how to fly and land a parachute safely.